Hepatoblastoma (HB) is rare but it is the most common malignant liver cancer in children, accounting for 50-60% of primary malignant pediatric liver cancers, as well as 25-45% of all liver tumors [1,2]. It predominantly occurs in infants and young children, and its incidence rate in Southeast Asia is higher than it is in Europe and North America [3,4]. Before the 1970’s, treatment for HB mainly involved surgical excision, and the survival rate of children with HB who did receive effective postoperative chemotherapy was only 20-30% . The 1980’s introduced strong and effective chemotherapy drugs, particularly the implementation of platinum-based chemotherapy, and the prognosis greatly improved, with the 5 y survival rate reaching 75% [6,7]. The Children’s Hepatic Tumour International Collaborative (CHIC) refined the PRETEXT clinical staging and risk factors, and stipulated that the combination of chemotherapy with surgery should remain as the primary treatment method for children with HB, because HB is sensitive to chemotherapy [8,9]. Currently, research centers in the United States, Germany, Europe and Japan, among others, have focused on the efficacy of individual chemotherapeutic regimens, surgical treatments, and liver transplantation in treating this patient population [10-13]. However, HB patients were mainly treated by surgery and chemotherapy, rare with liver transplantation and because of donor sources and government policy in China. In developing countries, there are larger HB patients. However, the report of HB patients are rare on the clinical characters, how to treat it, how the outcome of HB (survival, relapse, etc. ), follow-up. We have already known that the prognosis risk factors of HB mainly included age, serum AFP level, and clinic stage. CHIC shown that risk factors also included liver center venous invasion and venous thrombosis. The distant metastasis, postoperative residual, venous thrombosis is still difficult to treat for HB patients. We found an interesting thing that a high PLT level was associated with the chemotherapy sensitivity and outcome of HB patients. In recent 10 y, our center collected large HB patients. Therefore, our aim is to analysis the outcome, risk factors, chemotherapy efficacy, lab indicator characters of HB in department of Paediatrics of Beijing Tongren Hospital by analyzing the clinical data of 102 HB patients with chemotherapy and surgery. A total of 102 HB patients, pathologically and/or imaging finding chorographically and serologically diagnosed in Beijing Tongren Hospital from September 2006 to June 2014, were selected, including 55 male patients and 47 female patients. The median age was 1.5 y (range, 1 month to 15 y). According to COG post-surgical staging criteria, the patients were divided into stages I-IV based on the degree of malignancy [14,15]. According to the definition of the CHIC, Pathological type was divided into the epithelium type, macrotubular type and the mixed type . This study was conducted in accordance with the declaration of Helsinki. This study was conducted with approval from the Ethics Committee of the Capital Medical University. Written informed consent was obtained from all participants’ guardians. The treatment program of HB included chemotherapy and surgery. Pediatric patients with stage I tumors mainly underwent surgical treatment, and those with stage II tumors received both surgical therapy and postoperative chemotherapy, and the chemotherapy course was typically 6 cycles. General chemotherapy regime divided into preoperative chemotherapy and post-operative chemotherapy for HB patients of III stage and IV stage, 2~4 cycles of preoperative chemotherapy and 4~6 cycles of post-operative chemotherapy. The total chemotherapy course was 9-12 cycles. The chemotherapy regime was the criteria of COG . The personal chemotherapy regime treated HB patients with more than 3 y old or/and recurrence or refractory lesions, radiotherapy was performed after remission, as required. Chemotherapy regiments: the conventional regimens included C5V, AEP, ACP, and ITEC, etc. (Table 1). Table 1: Chemotherapy regime for HB patients. Serum AFP was measured at 0, 15, 21 d of every chemotherapy. The normal AFP level was 0~21 ng/dl. Blood routine examination was tested at 9, 7, 11, 13, 15, 17, 18, 19, 21 d of every chemotherapy using Japan SYSMEX XS-800i whole blood cell analyzer. The imaging examination of primary and metastatic site with B ultrasound and CT was performed every 2 cycles of chemotherapy. Complete remission (CR): The tumor completely disappeared without any evidence of residual tumor, and serum AFP was decreased to normal for more than 4 weeks. Partial remission (PR): The volume of the tumor decreased more than 50% of before the treatment without no new tumor, and serum AFP decreased significantly; Effective: CR and PR. Stable disease (SD): The volume of the tumor decreased less than 50% of before the treatment without any new tumor. No response (NR): The volume of the tumor decreased less than 25% without any new tumor. Progression of disease (PD): The volume of the tumor decreased less than 25% or with new tumor and serum AFP levels rose more than 20% of normal for 2 weeks. The standard of stop chemotherapy was Complete Remission (CR). When to stop chemotherapy: has got CR and complete the routine chemotherapy cycle followed the guidelines with regular follow-up. The follow-up period lasted until 1st January 2015. Patients were followed-up via hospital visits and telephone interviews as follows: 4 times in the hospital every 3 months after treatment, twice every 6 months, and once a year until the end of the follow-up period. The end-points of follow-up were death, recurrence, withdrawal from treatment, and remission. Patients who were lost to follow-up, withdrew from treatment, and underwent not standardized treatment were excluded. SPSS Version 19.0 was used for statistical analysis. The continuous data were expressed as the mean ± standard error, and the discrete data were expressed as the median and (minima, maxima). Statistical methods included t-test, chisquare test, Fisher’s exact test, Kaplan-Meier survival analysis and Mantel Cox log-rank test. Statistical significance was set at P<0.05. The median age of the 102 children was 1.5 y (range: 1 month to 15 y). The age-based frequency distribution of the patients in this study was as follows: <1 y, 35 cases, accounting for 34.3%; 1-3 y, 43 cases, accounting for 42.2%; and >3 y, 24 cases, accounting for 23.5%. According to COG post-surgical staging criteria, 4 patients had stage II tumors, accounting for 3.9%; 46 patients had stage III tumors, accounting for 45.1%; and 52 patients had stage IV tumors, accounting for 51.0% (52/102). In terms of histopathological staging, 52 cases were the epithelium type (57.1%), 11 cases were the macrotubular (12.1%) and 28 cases were the mixture type (30.76%). The diagnosis of 24 HB patients using clinical diagnosis method at the time of diagnosis, and of 98 HB patients using pathology criteria. The highest AFP level of 102 HB patients was 27777000 ng/ml, the lowest AFP level was 1.2 ng/ml. The average AFP level was 202813 ± 362993 ng/ml. The AFP level of only 2 HB patients were<100 ng/ml (1.96%), it of 13 HB patients were 100~1000 ng/ml (12.74%), and it of 87 HB patients were>1000 ng/ml (85.30%). Among the 102 HB children, 52 (51%) achieved complete remission (CR), 20 (19.6%) achieved partial remission (PR), and 28 (27.4%) died. Treatment efficiency (CR+PR) was observed in 72 cases, accounting for 69.6%. Follow-up lasted until 1st January 2015, with an average follow-up time of 27.54 ± 19.95 months. The longest follow-up time was 97 months. The 2 y Overall Survival (OS) rate was 76.54%, and the 3 y Event-Free Survival (EFS) rate was 60.5%. A total of 81 children were followed-up for more than 12 months. Kaplan- Meier survival analysis showed that the average 5 y survival rate was 71.1 months, with 95% CI of 61.15-80.9 months (Figure 1). 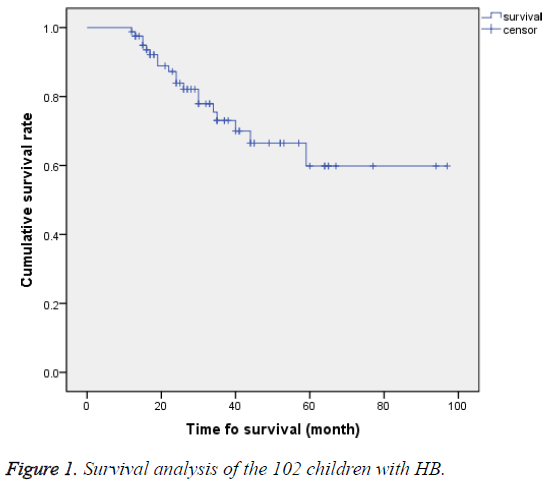 Figure 1: Survival analysis of the 102 children with HB. We selected 70 HB patients with the time of follow-up more than 12 months, 4 cases of II stage (5.7%), 32 cases of III stage (45.7%), and 34 cases of IV stage (48.6%). The average PLT count was 389 ± 242 × 109/L, the highest PLT count was 1550 × 109/L, the lowest PLT count was 70 × 109/L, and the median PLT count was 354 × 109/L. The PLT count of 61 HB patients was >300 × 109/L, account for 87.1%, and of 45 HB patients was >400 × 109/L, account for 64.3%. The ROC curve showed that the Area Under the Curve (AUC) was 0.799 (0.7~0.9). The cut-off point of AUC of PLT counts was 304 × 109/L using ROC analysis. The variant between PLT and prognosis was significant (r=0.01, P=0.011) (Figure 2). 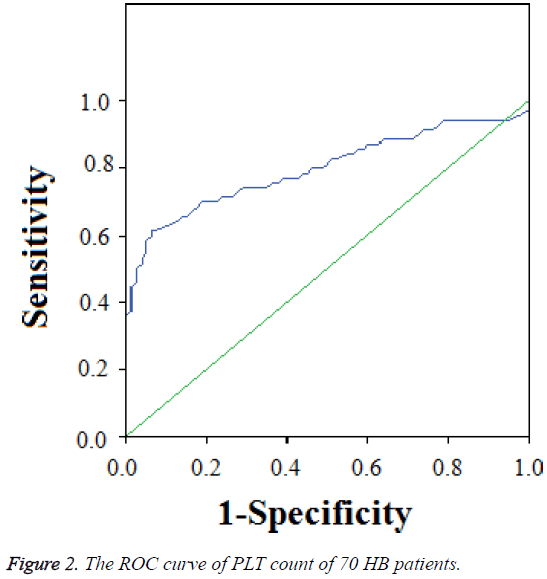 Figure 2: The ROC curve of PLT count of 70 HB patients. In this study, 17 cases were accompanied with multiple intrahepatic-occupying lesions, who were all in stage IV, accounting for 32.7% (17/52). After diagnosis, 1 patient among the 17 children was withdrawn from treatment, and the remaining 16 patients (94.1%) continued with regular treatment and were followed-up. These 16 stage IV patients were all accompanied with postoperative residues because of intrahepatic metastasis. Compared with the survival rate of children without intrahepatic metastasis, Fisher’s exact test showed that the children with intrahepatic metastasis had higher mortality (P=0.004). Moreover, the 3 and 5 y OS rates of children with intrahepatic metastasis were 17.8% and 8.9%, respectively, whereas those of children without multiple intrahepatic-occupying lesions were 75.6% and 32.4%, respectively. Log-rank test analysis showed that the survival time of stage IV patients with intrahepatic metastasis was shorter than without intrahepatic metastasis (χ2=7.467, P=0.006). The survival process exhibited a significant difference, and Kaplan-Meier survival analysis also demonstrated a significant difference (Figure 3). Figure 3: Survival analysis of stage IV patients with or without intrahepatic metastasis. Until the end time of follow-up, the 3 y OS rates of stages II, III and IV were 75%, 80.9% and 20.2%, respectively. 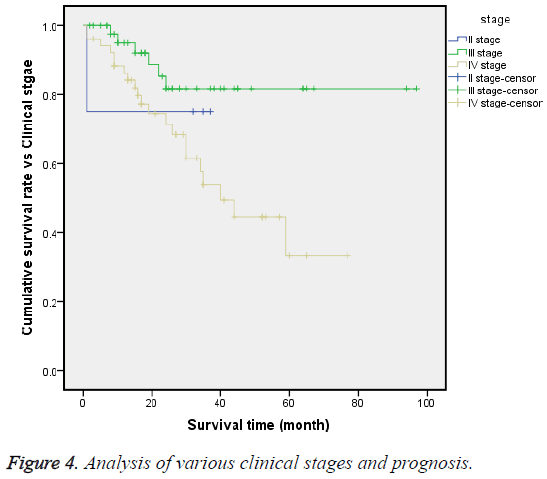 The logrank test (χ2=8.359, P=0.015) showed that the survival processes of these 3 stages were significantly different, and the median survival time of stage IV was 40 months, with CI of 27.8-52.2 months (Figure 4). Figure 4: Analysis of various clinical stages and prognosis. Multi factors analysis: Multi factors included different stages, different ages, distant metastasis or peritumoral invasion, multiple intrahepatic-occupying lesions, and different serum AFP levels. In 4 cases of II stage, 3-year EFS was 75% (3/4), the most risk factor was peritumoral invasion. In 43 cases of, 3 y EFS was 69.8 (30/42), the main risk factors were age and intrahepatic-occupying lesions, but no statistical difference. In IV stage, 25 cases attended 3 y EFS, the main risk factors were serum AFP (<100 ng/dL) and distant metastasis. HB is more common in infants and young children, especially in 1 to 2 y old children. About 60% of patients are up to 1 y old, and 85-90% patients are <3 y old. The age distribution of this study showed more children within 3 y old range, were consistent with the literature [17,18]. Currently, the main treatments for HB in children include chemotherapy, surgery, radiation therapy, targeted therapy, and immunotherapy [9,19-21]. Although various other means, which have improved the clinical remission rates of HB, have been applied, HB remains sensitive to chemotherapy, so chemotherapy and surgery are still the primary treatment methods. The major clinical challenges in HB include the preventing and reducing recurrence and improving clinical remission rates in high-risk cases as well as the overall survival rate. In clinical work, we found that some cases got serious platelet increase when newly diagnosed, especially the patients of stage IV, with a maximum of 1550 × 109/L. Increased platelet count in malignant solid tumors has been known as an independent prognostic factor besides tumor invasion and lymph node metastasis, which has shortened survival time . In this study, 87.1% cases with elevated platelet which was consistent with the literature. While the area under the platelet and HB ROC curve was 0.799, which meant medium diagnostic accuracy and the kick-off point is 304 × 109/L, which was not consistent with the previous literatures and was considered related with the small sample size. The International Childhood Liver Tumors Strategy Group (or SIOPEL, Society International d’Oncologie Pédiatrique- Epithelial Liver Tumor Study Group) has recommended preoperative neoadjuvant chemotherapy, delayed surgery and postoperative chemotherapy [14,22]. All HB children are required to undergo neoadjuvant chemotherapy when clear diagnostic results are obtained after biopsy. This requirement is because preoperative chemotherapy can shrink the primary tumor, thereby allowing complete tumor removal. Meanwhile, neoadjuvant chemotherapy can effectively kill the micro metastases inside the circulatory system, reducing the spread and distant metastasis of tumor cells. COG recommended that high-risk cases with vascular invasion or distant metastasis should receive neoadjuvant chemotherapy [23,24]. However, an increasing amount of evidence proved that children respond well to chemotherapy, so only a small incision is required and microscopic residuals need not be removed via a second operation . This discovery has made surgery feasible among children with traditional central positioning or POSTTEXT III or IV after chemotherapeutic pre-treatment, and may achieve good results. Given that the children included in this study were mainly in stages III and IV and combined with the applications of domestic chemotherapeutic drugs, our center applied the chemotherapeutic regimens with ifosfamide, carboplatin and etoposide for the treatment of patients with high-risk disease and recurrence based on the COG treatment program. Although the chemotherapeutic cycle of each collaborative group was considered to be within 8 cycles, this study showed higher rates of recurrence (45 cases, 44.1%) and higher mortality (28 cases of death). Therefore, our hospital adopted a new treatment regime for treating HB according to clinical practice (Figure 1). Our results showed that clinical efficacy reached 69.6%, the 2 y OS rate reached 76.54% and the 3 y EFS rate reached 60.5%. These values were close to or slightly higher than those reported by Rebeckeca et al. in 2014, indicating that the comprehensive treatment method was effective [7,15]. Although 4 major research organizations, namely, CHIC, COG, GPOH and JPLT, have various definitions of the risk factors of HB, causing difficulties when comparing the prognosis, the HB staging systems by these 4 organizations basically form 2 systems. Over the past 10 y, each individual collaborative group has defined the factors related to diagnosis and treatment, and that can affect prognosis [26,27]. COG defined the foetus type, which was also diagnosed in stage I, as having a good prognosis, and the main factors of poor prognosis included stage IV accompanied by distant metastasis, AFP<100 and tumor tissue morphology of ‘undifferentiated small round cell’ type [24,28]. Other factors that might affect the prognosis were tumor rupture during diagnosis, vascular involvement, extra hepatic invasion, age, and abnormally increased serum AFP (>1200,000) or 100-1000. The patients in this study, according to COG’s risk grouping criteria, were mainly in stages III and IV, accounting for 47.1% and 49.0%, respectively. COG identified multiple intrahepatic-occupying lesions, caudate lobe violation, peritissue involvement, and undifferentiated small cell type as the factors that would affect the prognosis of HB. In the present study, 17 patients exhibited multiple intrahepatic-occupying lesions, accounting for 34% of stage IV cases, with a 5 y OS rate of only 8.9%. Thus, multiple intrahepatic-occupying lesions resulted in poor prognosis and high mortality. Stages III and IV were advanced stages, with a high risk of recurrence and a low remission rate because of multiple organ involvement. The patients in this study with distant metastasis accounted for 40.19% (41/102), and the mortality rate reached 27.4% after regular treatment and follow-up. Considering the rate of recurrence of HB in children, accompanied with high-risk factors or wide tumor invasion range upon treatment, assessment of post-recurrence condition and clinical efficacy is essential to determine whether the outcomes of high-risk cases can be improved . In the current study, 39 patients exhibited recurrence during postoperative chemotherapy or follow-up. Recurrence mainly occurred in stage IV, accounting for 77.8% of all recurrent cases, and the mortality was high (20 cases). The 3 y OS rates of clinical stages II, III and IV were 75%, 80.9% and 20.2%, respectively. Combined with the results of multivariate and survival analyses in Figure 4, different stage and different risk factors exhibited great differences in EFS. The patients with risk factors such as central venous invasion, hepatic portal vein, and peritissue invasion exhibited a survival period that was significantly shorter than those without the abovementioned risk factors (P=0.023). Other factors that might affect prognosis, such as age, serum AFP level, tumor stage, and association of risk factors, were also analyzed in this study. Despite the high number of middle and high-risk cases, the therapeutic effects were still satisfactory after regular treatment. The 3 y EFS of the patients in stage IV and associated with distant metastasis reached 51.2%, whereas those of stage III (1-3 y old, AFP>100) and stage IV (<1 y, AFP>100) were 62.5% and 66.7%, respectively. The 3 y EFS of the patients in stage III (<1 y, AFP>1000) was 71.4%. The influences of various risk factors on prognosis according to Kaplan-Meier survival analysis differed, and the differences were statistically significant. Thus, the age, serum AFP level, and clinical stage should be considered comprehensively during diagnosis, as these factors significantly influence both prognosis and the risk of recurrence. In summary, analyses on the disease characteristics and prognosis of the 102 children with HB in this study showed that the disease conditions of the children enrolled into our center were severe, with a high recurrence rate. The stage IV patients accompanied with distant metastasis exhibited poor prognosis, although the patients with recurrence or distant metastasis could still demonstrate a high rate of clinical remission after regular comprehensive treatment. Therefore, we should increase the awareness of patients and their families, improve regular treatment methods for HB children, and encourage regular follow-up visits. The survival rate of children with HB at home, especially the advanced cases, is still not at par with that of foreign countries, and the efficacy of HB treatment depends on regular treatment strategies. Standard chemotherapy before and after surgery is a key step to improve the survival of children with HB. The data of HB was highest in stage IV, which could be an indicator in early diagnosis. The liver is an important organ involved in the coagulation mechanism, the increasing of PLT suggested HB lead to abnormal coagulation and the monitoring of PLT is important in clinics. This study was supported by Special Projects of Capital Health Development and Research (Youth Project, 2014-4-2054). von Schweinitz D. Hepatoblastoma: recent developments in research and treatment. Semin Pediatr Surg 2012; 21: 21-30. Pizzo PA, Poplack DG. Principles and practice in paediatric oncology (6th edn). Lippincott Williams and Wilkins 2010; 838-860. Aronson DC, Czauderna P, Maibach R, Perilongo G, Morland B. The treatment of hepatoblastoma: Its evolution and the current status as per the SIOPEL trials. J Indian Assoc Pediatr Surg 2014; 19: 201-207. Raney B. Hepatoblastoma in children. J Pediatr Hematol Oncol 1997; 19: 418-412. Evans AE, Land VJ, Newton WA, Randolph JG, Sather HN, Tefft M. Combination chemotherapy (vincristine, adriamycin, cyclophosphamide, and 5-fluorouracil) in the treatment of children with malignant hepatoma. Cancer 1982; 50: 821-826. Tiao GM, Bobey N, Allen S, Nieves N, Alonso M, Bucuvalas J, Wells R, Ryckman F. The current management of hepatoblastoma: a combination of chemotherapy, conventional resection, and liver transplantation. J Pediatr 2005; 146: 204-211. Towu E, Kiely E, Pierro A, Spitz L. Outcome and complications after resection of hepatoblastoma. J Pediatr Surg 2004; 39: 199-202. Czauderna P, Lopez-Terrada D, Hiyama E, Häberle B, Malogolowkin MH, Meyers RL. Hepatoblastoma state of the art: pathology, genetics, risk stratification, and chemotherapy. Curr Opin Pediatr 2014; 26: 19-28. Meyers RL, Tiao GM, Dunn SP, Langham MR Jr. Liver transplantation in the management of unrespectable hepatoblastoma in children. Front Biosci (Elite Ed) 2012; 4: 1293-1302. Brown J, Perilongo G, Shafford E, Keeling J, Pritchard J, Brock P, Dicks-Mireaux C, Phillips A, Vos A, Plaschkes J. Pre-treatment prognostic factors for children with hepatoblastoma: results from the International Society of Paediatric Oncology (SIOP) study SIOPEL 1. Eur J Cancer 2000; 36: 1418-1425. Meyers RL, Rowland JR, Krailo M, Chen Z, Katzenstein HM, Malogolowkin MH. Predictive power of pre-treatment prognostic factors in children with hepatoblastoma: a report from the Children’s Oncology Group. Pediatr Blood Cancer 2009; 53: 1016-1022. Meyers AB, Towbin AJ, Geller JI, Podberesky DJ. Hepatoblastoma imaging with gadoxetate disodium-enhanced MRI--typical, atypical, pre and post-treatment evaluation. Pediatr Radiol 2012; 42: 859-866. Roebuck DJ, Aronson D, Clapuyt P, Czauderna P, de Ville de Goyet J, Gauthier F, Mackinlay G, Maibach R, McHugh K, Olsen OE, Otte JB, Pariente D, Plaschkes J, Childs M, Perilongo G. 2005 PRETEXT: A revised staging system for primary malignant liver tumours of childhood developed by the SIOPEL group. Pediatr Radiol 2007; 37: 123-132. Czauderna P, Otte JB, Roebuck DJ, von Schweinitz D, Plaschkes J. Surgical treatment of hepatoblast oma in children. Pediatr Radiol 2006; 36: 187-191. Meyers RL, Tiao G, de Ville de Goyet J, Superina R, Aronson DC. Hepatoblastoma state of the art: pre-treatment extent of disease, surgical resection guidelines and the role of liver transplantation. Curr Opin Pediatr 2014; 26: 29-36. Katzenstein HM, Chang KW, Krailo M, Chen Z, Finegold MJ, Rowland J, Reynolds M, Pappo A, London WB, Malogolowkin M. Amifostine does not prevent platinum-induced hearing loss associated with the treatment of children with hepatoblastoma: A report of the intergroup hepatoblastoma study P9645 as a part of the children's oncology group. Cancer 2009; 115: 5828-5835. Brugières L, Branchereau S, Laithier V. Pediatric malignant liver tumors. Bull Cancer 2012; 99: 219-228. Matsunaga T, Sasaki F, Ohira M, Hashizume K, Hayashi A, Hayashi Y, Mugishima H, Ohnuma N. Japanese Study Group for Pediatric Liver Tumor. Analysis of treatment outcome for children with recurrent or metastatic hepatoblastoma. Pediatr Surg Int 2003; 19: 142-146. Ayllon Teran D, Gómez Beltran O, Ciria Bru R, Mateos González E, Peña Rosa MJ, Luque Molina A, López Cillero P, Briceño Delgado J. Efficacy of neoadjuvant therapy and surgical rescue for locally advanced hepatoblastomas: 10 year single-center experience and literature review. World J Gastroenterol 2014; 20: 10137-10143. Gupta AA, Gerstle JT, Ng V, Wong A, Fecteau A, Malogolowkin MH, Meyers RL, Grant D, Grant RM. Critical review of controversial issues in the management of advanced pediatric liver tumors. Pediatr Blood Cancer 2011; 56: 1013-1018. Kelly D, Sharif K, Brown RM, Morland B. Hepatocellular carcinoma in children. Clin Liver Dis 2015; 19: 433-447. Buckley JD, Sather H, Ruccione K, Rogers PC, Haas JE, Henderson BE, Hammond GD. A case-control study of risk factors for hepatoblastoma. A report from the Children’s Cancer Study Group. Cancer 1989; 64: 1169-1176. Malogolowkin MH, Katzenstein HM, Meyers RL, Krailo MD, Rowland JM, Haas J, Finegold MJ. Complete surgical resection is curative for children with hepatoblastoma with pure foetal histology: a report from the Children’s Oncology Group. J Clin Oncol 2011; 29: 3301-3306. Spector LG, Birch J. The epidemiology of hepatoblastoma. Pediatr Blood Cancer 2012; 59: 776-779. Czauderna P, Zbrzezniak G, Narozanski W, Korzon M, Wyszomirska M, Stoba C. Preliminary experience with arterial chemoembolization for hepatoblastoma and hepatocellular carcinoma in children. Pediatr Blood Cancer 2006; 46: 825-828. Aronson DC, Schnater JM, Staalman CR, Weverling GJ, Plaschkes J, Perilongo G, Brown J, Phillips A, Otte JB, Czauderna P, MacKinlay G, Vos A. Predictive value of the pre-treatment extent of disease system in hepatoblastoma: results from the international society of pediatric oncology liver tumor study group SIOPEL-1 study. J Clin Oncol 2005; 23: 1245-1252. Fuchs J, Rydzynski J, Von Schweinitz D, Bode U, Hecker H, Weinel P, Bürger D, Harms D, Erttmann R, Oldhafer K, Mildenberger H. Study Committee of the Cooperative Pediatric Liver Tumor Study Hb 94 for the German Society for Pediatric Oncology and Hematology. Pre-treatment prognostic factors and treatment results in children with hepatoblastoma: a report from the German cooperative pediatric liver tumor study HB 94. Cancer 2002; 95: 172-182. Maibach R, Roebuck D, Brugieres L, Capra M, Brock P, Dall'Igna P, Otte JB, De Camargo B, Zsiros J, Zimmermann A, Aronson D, Childs M, Scopinaro M, Morland B, Plaschkes J, Czauderna P, Perilongo G. Prognostic stratification for children with hepatoblastoma: the SIOPEL experience. Eur J Cancer 2012; 48: 1543-1549.